The Taiwanese Ministry of Foreign Affairs is determined to peacefully settle disputes over the South China Sea islands with neighbouring countries. A joint exploitation of the islands, the promotion of a peaceful dialogue as well as the use of negotiation should constantly be privileged in resolving this long-lasting issue that has greatly burdened Asian countries. The Ministry of Foreign Affairs on Saturday [12 July 2014] reaffirmed Taiwan's sovereignty over four island groups in the South China Sea, while urging neighboring countries and territories involved in territorial disputes in the area to resolve their differences through dialogue and negotiation. 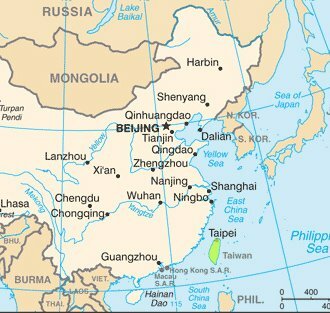 From the perspective of history, geography and international law, the Spratly Islands, as well as the Paracel, Macclesfield and Pratas island groups and their surrounding waters are all undoubtedly an inherent part of the Republic of China (Taiwan) territory, said MOFA spokeswoman Anna Kao. The ROC government is willing to uphold the basic principles of "safeguarding sovereignty, shelving disputes, promoting peace, reciprocity and joint exploration" and work with other countries to maintain regional peace and stability, Kao said. The government is also urging neighboring countries to exercise self-restraint so that the South China Sea disputes can be resolved peacefully through dialogue and consultation, Kao said. She was commenting on a proposal Friday [11 July 2014] by Michael Fuchs, U.S. deputy assistant secretary of state for Strategy and Multilateral Affairs, for claimant states to clarify and agree to voluntarily freeze certain actions and activities that escalate disputes and cause instability in the region. Fuchs said the U.S. wants the 10-nation Association of Southeast Asian Nations (ASEAN) and China to have "a real and substantive discussion" to flesh out a call for self-restraint contained in a Declaration of Conduct they agreed to in 2002, with a view toward signing a formal maritime Code of Conduct. He said it would be up to the claimants to decide what elements should be included in a freeze, but these could include recommitting not to establish new outposts or seize territory another claimant had occupied before the 2002 declaration. Claimants could also define what types of actions would be considered provocative and what were merely efforts to maintain a long-existing presence dating back to before 2002, Fuchs suggested. "For example, alterations that fundamentally change the nature, size or capabilities of the presence could fall under the freeze, whereas routine maintenance operations would be permissible," he told a Washington think tank. The U.S. is expected to push the proposal at a gathering of Asian foreign ministers in Myanmar next month [August]. Kao said that Taiwan and the U.S. have maintained an effective communication channel and have a good understanding of each other's stance on a peaceful resolution to the South China Sea territorial disputes. Taiwan is working to further exchange views with the U.S. on its proposal and the situation in the South China Sea, she added. Also Saturday [12 July 2014], ruling Kuomintang Legislator Lin Yu-fang said that Fuchs' proposal does not take aim at Taiwan because Taiwan has not taken any of the actions against which the U.S. advised. "We are not one of the troublemakers; the U.S. fully understands this," Lin added.